Yesterday the 204th Air Lift Squadron flew into the Reno National Air Championship Races and Air Show and I had the pleasure to meet and photograph a few of the handsome young men serving our country. I caught them as they were touring the pits in their “Mule” collecting Reno Race mementoes and admiring the War Birds like the rest of us. 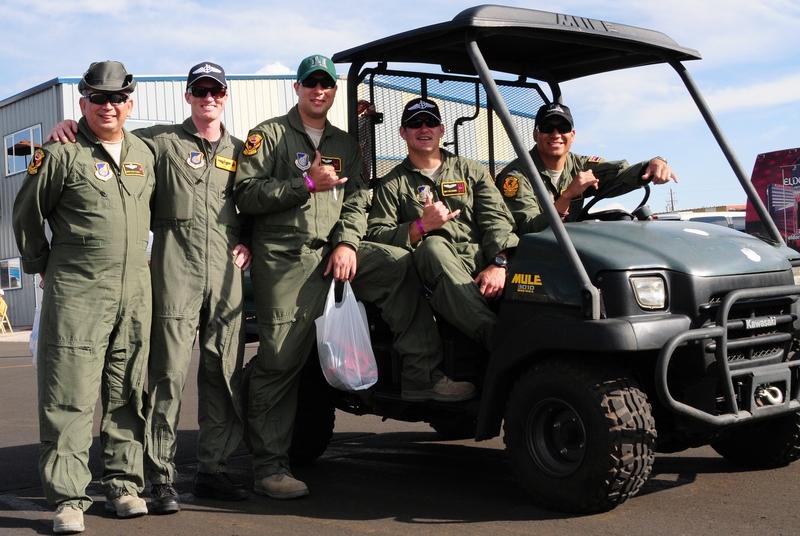 204th Air Lift Squadron and their "MULE"
From left to right: Chief Master Sargent Alan R. Ogata; Captain “EHU” (call letters) Eric Thorstad – F-22 Pilot; Staff Sargent & Load Master Makaio Roberts; Captain Britton Komine – C-17 Pilot; Captain MG Namocot – C17 Pilot. The men are stationed in Hawaii and make the annual trip to Reno to show off their version of a War Bird! The huge C-17 Cargo Plane is located in the military static display for everyone to see inside and out and meet the crew. Included in the group is Captain Eric “EHU” Thorstad an F-22 Pilot who is not part of the 204th. 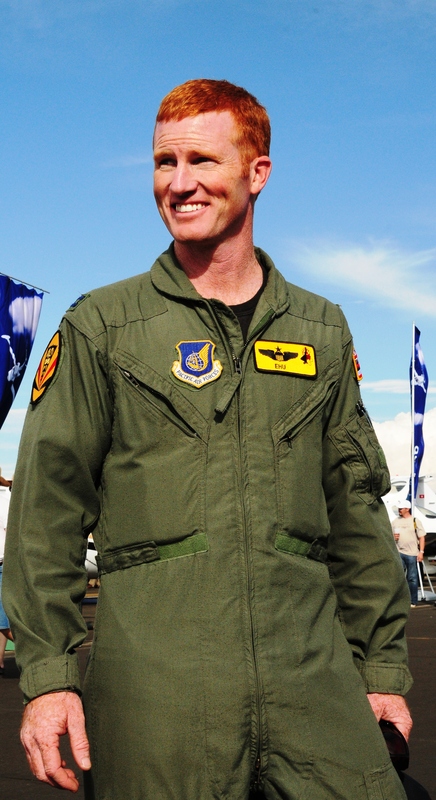 Captain Thorstad has accumulated 11 hours of flight time in the incredible F/A-22 Raptor. He recently graduated from the F-15E Eagle Advanced Attack Aircraft (a McDonnell Douglas fighter jet originally built with a secondary air-to-ground capability now used mainly for air to air duty in service) to the F/A-22 Raptor built by Lockheed Martin. This year the greatly anticipated Reno F/A-22 air show was cancelled much to the disappointment of all Race Fans. I asked if Captain Thorstad could elaborate on the “mechanical issues” reason for the stand down – evidently, an F-22 performing a standard training mission crashed in Alaska several months ago and sadly the pilot perished. The final report of the incident remains pending and for now speculation is that the “life support” system failed, providing only 10% of the required oxygen to the breathing apparatus. Until the report is complete and all modifications implemented, all F-22’s are grounded. The good news is that the Air Force anticipates resumed flight as early as this Monday – the bad news, one day late for the Reno air performance. 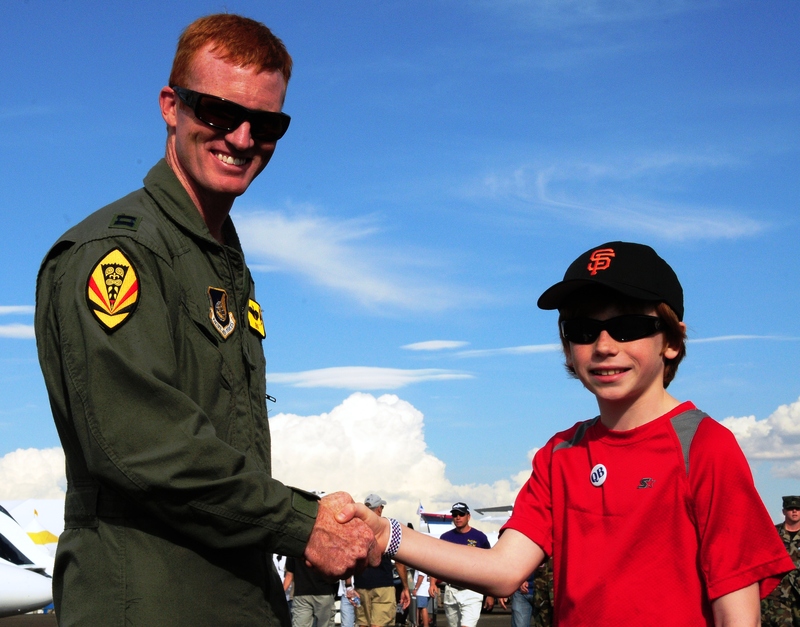 Good Luck and God’s Speed to Robbie the Redhead and his aviation future!